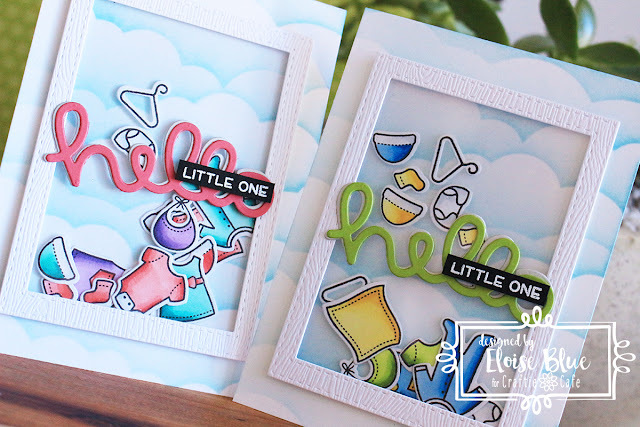 Hi everyone, Eloise here for Craftie Cafe and today I’ll be using the LittleBundle stamp set from Lawn Fawn to create two cards, a girl and a boy themed and they’re little clothes are going to be used as shaker pieces, which is super fun. To begin, I stamped and coloured my images from the LittleBundle stamp set and then used the coordinating dies to cut them all out. I sort of used more “boy” and “girl” themed colours for each card. Once all my pieces were die cut, I set them off to the side and worked on my shaker panels. I took two rectangle dies, nested them together and ran them through on some woodgrain cardstock, this will create a frame. I did this two times then went and used some score tape and added it along the back of each and added a piece of acetate. Then, I took some foam tape and added it around the edges also. Now, I needed to work on my backgrounds. I took two card bases cut to 4” x 11”, then scored at 5 ½” to create a top folding card and used the Clouds stencil from My Favorite Things to ink blend some Tumbled Glass Distress Ink over top. This creates the most realistic looking clouds and makes the background look so fun. If you don’t have this stencil, used acetate and cut your own or use a die to create cloud shapes, and just flip them each time to create the same look. I then laid my clothing in the middle of each card and adhered my frame over top of each of them. For my sentiment, I took the Scripty Hello from Lawn Fawn and die cut it twice from grey cardstock and another time from green and pink cardstock. I used Guava and Cilantro from Lawn Fawn for this. Once they were die cut, I adhered them together using liquid glue off centre, so each of them have a grey shadow background. I then adhered them into the centre of my shaker panels and then used some black strips of cardstock to stamp ‘Little One’ onto then white heat embossed them and adhered them on top of my sentiments and that finished off my card for today. I hope you enjoyed and I’ll catch you next time! Such sweet cards! LOVE these!